Karl Rammelt was born on 10 June 1914 at Nebra in the Unstrut region of Sachsen. From 1934 until 1940 he was part of the technical personnel of the Luftwaffe. On 20 May 1942, Rammelt was posted to JG 51 based on the Eastern Front. Oberleutnant Rammelt was assigned to 4./JG 51. He recorded his first victory on 12 June. On 5 July, II./JG 51 under the leadership of Hauptmann Grasser scored 46 aerial victories. Hauptmann Hartmann Grasser (103 victories, RK-EL) shot down 8 enemy aircraft, Oberleutnant Karl-Heinz Schnell (72 victories, RK) and Feldwebel Anton Hafner (204 victories, RK-EL) shot down seven each and Oberleutnant Rammelt downed five. He was to record 15 victories during his time on the Eastern front. In November 1942, II./JG 51 was transferred to Tunisia. On 2 March 1943, Rammelt was named Staffelkapitän of 4./JG 51. He recorded nine victories during his time in Africa. On 7 June 1943, Hauptmann Grasser left II. Gruppe and Hauptmann Rammelt became its Kommandeur. He was to lead the Gruppe in combat over North Africa, Italy and the Balkans. He recorded four victories over Sicily. On 25 June, Rammelt was awarded the Ehrenpokal. Bf 109 G-6 flown by Hauptmann Karl Rammelt, commander of II./JG 51, while based at Munich-Neubiberg. Note the mace. On 14 October 1943, at 14:20, II./JG 51 engaged the bomber formations headed for Schweinfurt north of Frankfurt and succeded in destroying nine USAAF B-17 four-engined bombers. Hauptmann Rammelt was able to bring down a B-17 to record his 30th victory. However, his fighter was heavily shot up by return fire from the bombers and he was forced to bale out. On 20 December, II. 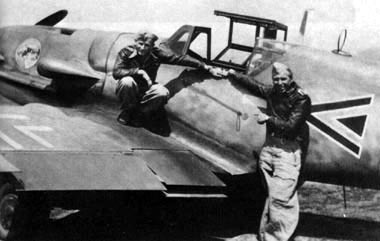 Gruppe shot down six USAAF P-38 twin-engined fighters, of which one was credited to Rammelt. Rammelt destroyed a USAAF B-24 four-engined bomber and claimed another as a Herausschuss on 28 December 1943. Return fire from the bomber formation, however, hit his aircraft over Padova. His aircraft was badly shot up and he was forced to abandon his Bf 109 G-6 (WNr 160 717) “Black <<+” by parachute once again. 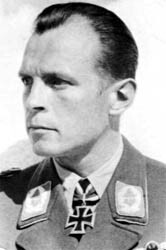 During his recovery from wounds, II./JG 51 was led by Oberleutnant Günther Rübell (48 victories, RK).  He was awarded the Deutsches Kreuz in Gold on 16 January 1944. On 24 October 1944, he received the Ritterkreuz for 41 victories. Rammelt was seriously wounded in combat over Hungary on 23 December 1944, baling out of Bf 109 G-14 (WNr 780887) "Black <<" after downing a USAAF B-24 four-engined bomber. His wounds were serious enough that he did not return to combat duty. Leadership of II. Gruppe was passed to Oberleutnant Otto Schultz (73 victories, RK) for the rest of the war. Karl Rammelt was credited with 46 victories in 450 combat missions. He recorded 20 victories over the Eastern Front. Of his 26 victories recorded over the Western Front, 11 were four-engined bombers. He also recorded 14 unconfirmed victories of which 12 were achieved over the Eastern front and two were four-engined bombers recorded over the Western front. - P-38 Stab II./JG 51 24.12.1943?